The new Minister for Social Protection came under some early opposition criticism today. 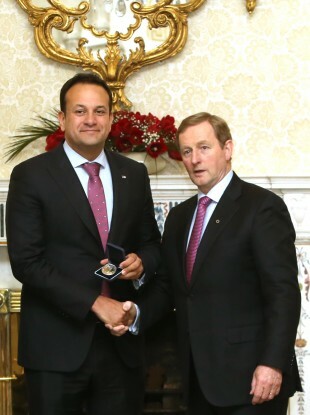 LEO VARADKAR HAS spoken about his new ministerial role – acknowledging that it “may well be a sideways move” and saying that he would miss being Minister for Health. Speaking on RTÉ’s Saturday with Brian Dowling, Varadkar outlined his plans for the future, after his appointment yesterday as the Minister for Social Protection. “I’m in some way sorry to be leaving Health,” said Varadkar. It was a really tough department, probably the toughest in government but it is one where you can make an important impact. Varadkar said that the Department for Social Protection had the highest budget and that helping the self-employed, moving towards a “working family payment” and introducing a universal pension system are among the plans he had for it. However, Varadkar conceded that what could get done would depend on how long the government lasts. Criticising Fine Gael early, AAAPBP TD Bríd Smith, who also spoke on the programme, questioned some of the party’s policy plans. She questioned the statement by Varadkar that his Department would try to “make work pay” to stop people falling into poverty traps. Smith called the measure “Tory-like” and also questioned plans to link the payment of child allowance with a child’s school attendance. Fianna Fáil TD Seán Fleming said that checks were already done at schools to ensure that the children of parents who had moved to Ireland from abroad were attending and not living in a different country. Smith called this a “racist” measure, while Varadkar said that while he was minister he “won’t be doing anything racist”. Fleming said that Fianna Fáil were still in opposition even though they had facilitated the forming of the Fine Gael-led government, and that they would hold the party to account. “Fianna Fáil did not vote yesterday for Enda Kenny to become Taoiseach,” said Fleming. We did not vote for any of the ministers to be appointed last night. Fianna Fáil did not support them. Varadkar said that Fine Gael were “sorry” that they couldn’t bring more Independents onboard to support the government yesterday. 59 TDs voted for Enda Kenny to become Taoiseach yesterday, leaving the party without a strong number above the absolute minimum needed to form a government. Independent Roscommon TD Michael Fitzmaurice, who backed out of supporting Kenny for Taoiseach over the situation of turf cutters in the midlands, said that it was important for all of the members of the Dáil to work together. “This Dáil will be as good as every single one of us here and within the Dáil make it,” he said. “If we want to be constructive, if we want to make it a better place for all the people – that is up to us. It’s up to every one of us.. to put ideas forward, to work constructively… at the end of the day be honest and straight out about it. Criticising the Independents, Sean Fleming said that the ones who supported Kenny were given gifts in exchange for their vote, and that their appointments and the promises given were not “in the national interest”. Email “Leo: Social Protection not a demotion but "may well be a sideways move"”. Feedback on “Leo: Social Protection not a demotion but "may well be a sideways move"”.